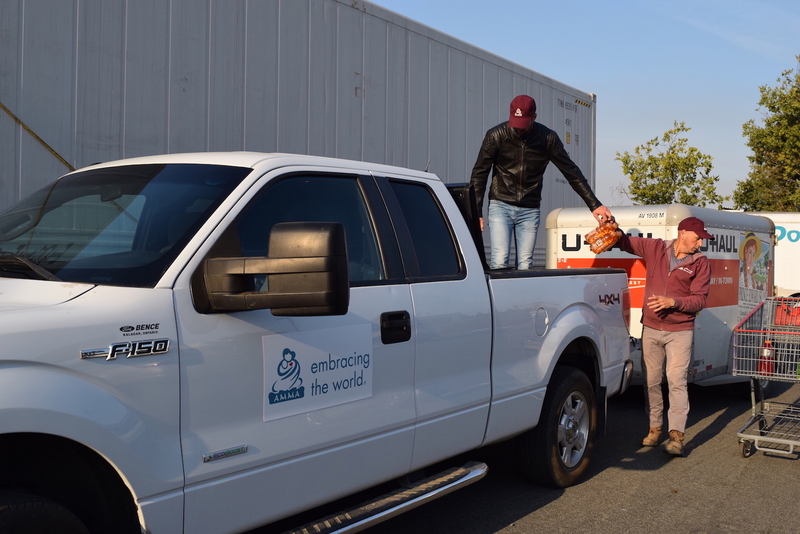 On Sunday, Oct. 15th, three volunteers from MA Center San Ramon, (Kalidas, Amartya, and Tobi) headed to the Sonoma County Fairgrounds to deliver donations that were collected at MA Center San Ramon, to the hundreds of evacuees of the NorCal fires that were being housed there. Blankets, masks, food, water, and more were graciously received by volunteers at the site. We were able to make a good assessment of the situation on the ground. The Sonoma Fairgrounds is where the majority of evacuees are staying - there are hundreds of sleeping cots set up very close together in the main pavilion. Tents and campers are also set up in the parking lots and large farm animals are being kept there as well. Army guards are on watch 24/7 to keep out trouble. And it also looks to be the main station for the firefighting efforts as we saw hundreds of fire trucks in the lots. December 17, 2015 - Berkeley Mother's Kitchen served its annual Christmas Meal and Gift Giveaway at South Berkeley Community Church on Thursday, December 17th this year. In addition to a three-course hot meal and dessert, gifts were distributed to approximately 120 people. Each person received a pair of socks, a choice of hat or scarf, one jar of peanut butter, one jar of strawberry jam and a choice of other food stuffs ranging from breakfast cereal to soft drinks. Toys both new and used (in excellent condition), were also offered to be given as gifts to family and friends; as well as a selection of warm coats and jackets, including children's sizes. Every one received a Seasonal Greeting card with a ten-dollar Safeway gift card inside. A good time was had by all! As Amma says, the spirit of Christmas is Caring and Sharing! December 20,2015 - South Bay Satsang served dinner at CHAM (Christian Homeless Alliance Ministry). Also delivered sleeping bags, blankets, jackets, tarps etc.. donations made possible by Amma's grace through some of the devotees. Hoping that these would make life a little easier for those who are currently living out in the rain and cold. MA Center organized a few Community Outreach Activities in honor of Amma's 62nd birthday, including helping out at two different locations of Habitat for Humanity and serving lunch at St. Anthony's Church in San Francisco. MA Center Satsang families living in South Bay, take turns every week to pack 80 - 90 lunch bags with sandwich, fruit, chips and juice and deliver them to the Cathedral Basilica of St. Joseph in San Jose. The church distributes these lunch bags to the homeless people in that area. Every second Sunday of the month, volunteers prepare delicious and healthy warm vegetarian dinner and serve about 50 - 70 families at the Family Shelter on King Road in downtown San Jose. Every third sunday of the month, volunteers prepare and serve dinner to the attendees of the Community Homeless Alliance Ministry in downtown San Jose. Volunteers pack rice, beans, flour, sugar and oil during the year for donation to immigrant farm workers at a center in Los Altos. For the past two years, volunteers have been making contributions in August to Nuestra Senora de Guadalupe Church in San Jose. One of the contribution was a back-to-school drive, donating back packs and all necessary school supplies to about 40 - 50 children. Donations in kind and cash are collected for Nuestra Senora de Guadalupe Church. Based on the donations in kind we received and with the cash donations, we should have about 100 people stay warm and dry this winter. We sincerely appreciate the loving efforts and the wonderful community services of the Bay Area Satsang Groups! For volunteering or any other information on the above projects please contact Suneetha or Ganga. The Craft Guild members have been quietly knitting hats and scarves. During the November tour we sold out on hats and scarves which were hand knitted or crocheted and reasonably priced in the Amma shop. Many hand knitted or crocheted hats and scarves were put in packages and given to the homeless through the One More Smile Project which gives items to homeless people being released onto the streets from hospitals. A nurse who is a Craft Guild member and follower of Amma organizes the One More Smile Project. Hats and scarves are also distributed through Mother's Kitchen in Berkeley. • The Craft Guild also made aprons and gave them to Mother's Kitchen in Berkeley. A set of cooks aprons and a set of hand crocheted hair nets or "snoods" were made for November tour cooking staff. These items were far superior to what can be purchased at stores! • Many baby blankets and baby hats were hand stitched or hand knitted for the Rice Plus Project in Carmel. These are given to needy mothers. • Pet comforters were hand crafted from soft fleece and given to The East County Animal Shelter in Pleasanton for abandoned pets. • Ashram artists got together and painted bird houses in support of Amma's Indeed Campaign. Some birdhouses were sold during June and November tours in the Amma shop. • The ceramics movement at the MA Center continues to gain momentum, selling many hand thrown mugs and sculptures during Amma's birthday celebration and June & November tours. All these items are sold in the Amma shop year round in San Ramon. The ceramics are probably the best selling items produced by the Craft Guild and we hope to expand this project in the coming year. • There are Craft Guild members who continue the legacy of the Plastic Project, making useful wallets, vests, totes, and many other items out of recycled or cast off materials. • The Craft Guild offered free sewing workshops this past year and will teach sewing, knitting, and Plastic Project techniques in early 2015. Circle of Love letters give writers an opportunity to reach out to others with loving care. We are always looking for people to join us. Volunteer writers make a commitment to write weekly for three months. Recipients have the benefit of experiencing that someone cares. 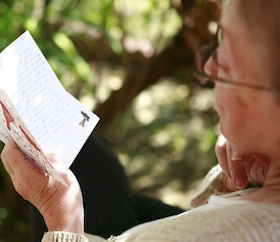 We write to people in the community who are sick, grieving, isolated or feeling lost. Are you facing a difficult time and would like support and encouragement? Would you, or someone you know, enjoy receiving a letter from one of our volunteers? Contact Circle of Love to get more information about writing and, or, receiving letters for yourself, or someone you would like to refer to us. Through letters, Circle of Love Inside brings Amma's love to people in prison. As a part of this program, the MA Center San Ramon sends Amma’s books free of charge to inmates. Community outreach to recycle clothing and donate the sale proceeds to Amma's charities. Threads is located near Amrita Hall and features men & women's Western and Indian clothing. Handmade and one-of-a-kind articles are also found there.Visit the Threads facebook page to see more pictures. The Amma Shop: offering spiritually-based gifts including books and music, herbal products, clothes and jewelry. Participating in the fairs is a wonderful way to introduce people to Amma and her charitable projects. The San Ramon center engaged in fund raising for Amma’s projects almost from its inception, though it was the 2004 tsunami in Southeast Asia that spurred major efforts to support Amma’s burgeoning humanitarian projects. 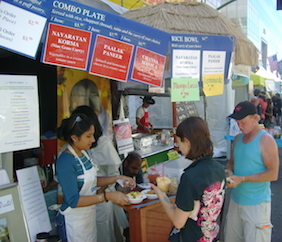 Immediately after the tsunami, there was an explosion of events, some at MA Center, some at other San Francisco Bay Area venues. A vision for ongoing fund raising took shape. From cooking classes and garage sales to major music and dance concerts, community members came forward offering their talents and skills. The relentless list of natural disasters—earthquakes in India and Haiti, the New Orleans flood disaster, Japan’s tsunami and nuclear catastrophe—all became motivation for our community to band together in fundraising.